Should I really be upset about this? So I go to Balloon Juice this morning and I see a link to this, something called "The Lady's Brunch Burger" from Paula Deen at the Food Network. Check out the picture. If that picture looks familiar, it might be because it's a sandwich that's been around for a long time. It's called the Luther, and I wrote about it over 4 years ago. The name supposedly comes from Luther Vandross, either because he ate them or he invented them--no one really knows for sure. It's famous enough that it warranted an entire scene in season 1 of the animated series The Boondocks, in the episode titled "The Itis." And if I could find the video of Granddad making it and Riley eating it, I'd post it. But no mention of it on the page where Deen re-invents it as "The Lady's Brunch Burger." When I posted this on Facebook, Amy replied with "By "lady" I assume she means 400 pound post-amputation pre-stroke diabetic in an Ambien fugue." So I started to wonder, might it be a good thing that Deen "created" this burger for a different (whiter) audience? Maybe I just ought to lay low on this one, for the good of everyone involved. I keep seeing this pop up in my Facebook feed--"So-and-so and 18 of their friends joined the group 'Petition to remove facebook group praying for President Obama's death.'" Here's the "prayer." In other words, it's a joke. Not a particularly good one, and not an original one either, as there was one circulating earlier which put George W. Bush in the place of Barack Obama, and a former student of mine put Fred Phelps in there as favorite preacher. And the people who are part of the original group aren't exactly covering themselves in glory--neither are those attacking the members of the page, I should point out as well. Put on boots if you're going to wade through that morass. I think the people who are calling for this group to be removed are overreacting more than a little. Obama hatred is irrational but not illegal. And the joke? It's on the members of the group. All of the people the joke references died in 2009, so if the members are serious about this, then either God told them to piss off, or Obama's mojo is stronger. I'm cool with either result. What's more, the joke misspelled the names of two of the people it includes--Patrick Swayze and Farrah Fawcett. But Brian, no doubt someone will reply, these people are fomenting hate against the President of the US. Perhaps. Then again, look back (or don't) through some of the things I wrote here during the Bush administration. You won't find the same poor quality of grammar or spelling, but you will find similar levels of vitriol, all aimed at George W. Bush and his administration. Lastly, even if this were an actual attempt to pray Obama to death, objecting to it doesn't really make a lot of sense. If you actually believe in a benevolent, omnipotent God, then you'd have to have faith that He's not going to be swayed by a group of Facebookers with questionable language skills, wouldn't you? The kind of God who'd cave to those people wouldn't be worth worshiping. And of course, if you're an atheist, then you're not worried about it having any effect. And on the plus side, a Facebook group like this makes it easier for the Secret Service to track people who might actually take this sort of thing seriously. 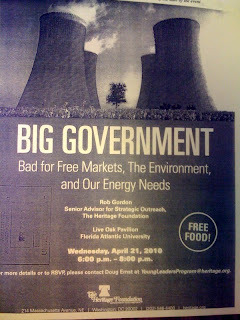 This flier started appearing on campus today, which is fine--I fully support conservative groups bringing on people to help advocate for their positions. And there's no hiding the agenda here--the Heritage Foundation is mentioned at the bottom and in the credits for the primary speaker. So good for them--open and free exchange of ideas and whatnot. If I were going, and if there were a Q&A at the end that I could get to the microphone for, though, I would have some questions about the premise of some of the claims mentioned on this flier. For example, the claim that Big Government is bad for free markets seems, at least from recent experience, to be pretty ludicrous. I mean, unless you like seeing market collapses across the board complete with massive unemployment, you know, the way we did pretty much all the time before and during the Great Depression. We had small government before then, I'd say, and it didn't work out so well for anyone but the Robber Barons. But if the free market claim is ludicrous, the environment one is exponentially worse. Before big government got involved in the form of the Clean Air and Clean Water Acts and the EPA, the Cuyahoga River used to catch on fire, and pollutant levels were off the charts. Before big government got involved, you couldn't breathe in LA (and elsewhere) because of the smog, and acid rain was a part of daily life. Industry didn't slow polluting because it was bad for business--they did so because big government made them do so, and as a result, our air and water, while still not as clean as we'd like, are demonstrably cleaner than they were even thirty years ago. And that's much the same story when it comes to energy needs. Big government forced higher efficiency standards on housing and automobiles and industry, and as a result, we produce far more per unit energy than we were thirty years ago. Would we have made some improvements without the prodding from big government? Undoubtedly. Would they be as far-reaching as they have been? I have my doubts, mainly because industry showed no inclination toward such changes when they were less-regulated. I suppose those aren't really questions so much as they're statements, so here's the question I'd ask. 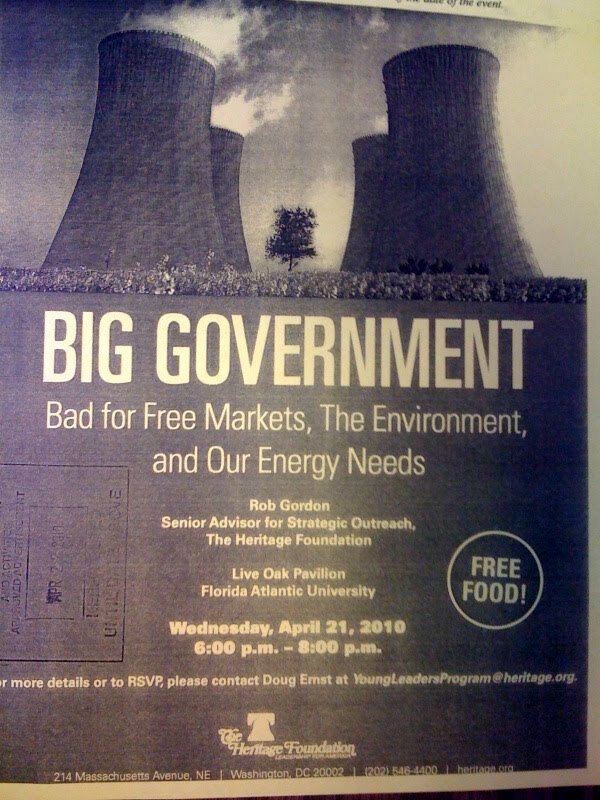 Given industry's dismal track record on free markets, the environment, and energy production and conservation, why should anyone trust them over big government, whose results are easily recognizable and beneficial? This is a great idea. We drive through Wilton Manors nearly every day, and we see the danger for pedestrians there. We were there the night one of those pedestrians was killed crossing the street, and we applauded when they dropped the speed limit from 35 to 30 mph. Wilton Manors has done some other things to try to improve the situation--installing more crosswalks and better lighting along with better enforcement of the speed limit has done wonders--but it seems to me that the only way to really make the situation better is to do what the locals are suggesting, and that means making it less accessible to fast traffic. Taking Wilton Drive down to one lane and emphasizing the pedestrian aspect of the town would be excellent, and I say this as someone who would be fairly inconvenienced if it happens, because I use Wilton Drive as a way to cut through from Sunrise to Oakland Park Blvd. all the time. Wilton Manors is one of those rare places in south Florida which is amenable to foot traffic, and we need to encourage those, nto discourage them. I hope this goes through. Part of the reason has to do with what conservatives see their problem as being. They honestly believe that they have the more popular positions on issues, and that the only reason Obama won was because he had the press on his side and because he was young, handsome, and could sell his story. Rubio, they feel, is their Obama, or he could be anyway. He's Cuban-American, but born in Miami. He's young--younger than me, which stings a little--and he's good-looking. Plus, he's full blown wingnut, and uncompromising about it. So in Rubio, conservatives see a savior--a right-wing Obama--and they figure that if they can counter liberal media with Fox News, and young-handsome with young-handsome, and not-white with not-white, then maybe the election gets reduced to issues, and they can win that fight. There are some major problems with that. For starters, conservative ideas aren't the most popular out there, and they never have been. If Rubio runs for President some day on a platform of repealing Medicare and Social Security, he'll lose like Goldwater. Plus, Rubio is way dirty financially speaking. Crist is starting to hit him hard on that, and I hope that Meeks will too, if Rubio wins the nomination. It's one thing to just be a hypocrite on fiscal responsibility--it's another to be personally corrupt. On the other hand, he will have the full backing of Fox News and the rest of the wingnut press. But for Rubio, the near future all rides on this Senate campaign. If he wins, he can be a rising star, and the wingnuts will indeed continue to love him like he's made of frosting and bacon. If he loses, either to Crist or to Meek, he's going to have a hard time coming back from that. My daughter tweeted this earlier. No idea how old it is or where it's from, but I thought it was too funny not to share. Ross Douthat takes on E.J. Dionne's column on the Florida Republican Senate primary in a blog post at the NY Times, and assails Dionne for praising a "'nonpartisan, non-ideological' Charlie Crist, with his 'sunny' attitude and his 'buoyant moderation.'" Douthat does this because Dionne is criticizing the Tea Partiers for being hyper-partisan and Douthat doesn't want to acknowledge that he's, well, one of them in a lot of respects. Douthat claims that Dionne fails to acknowledge any of Crist's failures as governor, and suggests that this is the real reason why Tea Partiers have deserted the once-popular governor, as opposed to the rabid know-nothingness that they display fairly regularly. Notably absent is any defense of Crist’s actual record as governor, which has been “moderate” in the worst sense of the word: Fiscally irresponsible on taxes and spending alike, and eager to use bailout dollars to delay the hard choices that Crist’s own profligacy created. Douthat conveniently overlooks one major problem with his own argument here. Crist doesn't set the budget alone. The Florida legislature has a prominent hand in it, and who's been serving in a prominent position in the legislature of late? Oh yeah--Marco Rubio, who was Speaker of the Florida House. What--he gets credit for being fiscally responsible? Marco of the sketchy spending of party and state funds? And Rubio's not alone--the Florida legislature has been in the hands of conservative Republicans for quite some time now, with many of the spending policies that Douthat calls profligate instituted under the governorship of Jeb! Bush, whose conservative credentials never seem to be called into question. In fact, the closer you look at Florida's fiscal wreckage, the more it becomes clear that it's hard-right conservatives who ought to be getting kicked in the teeth, not moderates, and especially not liberals. They've been in charge while the economy down here went careening off into the ditch, and if it hadn't been for Crist's embrace of the stimulus package, we'd have slid down even further. Funny how that never occurs to Douthat, isn't it? I don't like it. It's unnecessarily damaging to the environment, both from the drilling side and from the usage side, and the longer we drill, the longer we push off the necessary pain of switching over to clean, renewable energy sources. But I'm also incredibly cynical about human willingness to endure even slight discomfort in the short term for amazing benefit in the long term. I've been dieting for the better part of a year--I know of what I speak here. Even though I've dropped 25 pounds and kept it off without any major trouble, I still have another 25 (or so) to go, and that'll get me down to a hirsute 5'10" and 225. But pass up a chance to get a Popeye's three-piece? Can't do it, even though my heart would no doubt thank me later. It's the same with us--humans--and oil. Drive a smaller car to save gas, or even better, use public transportation or buy an electric car? Heaven forfend! Use less plastic? What are you, a commie? No--we'll drill until there's nothing left to wring out of the earth and until south Florida is under water because we've melted off the icecaps, because we're crap at changing and sacrificing. Maybe some new technology will save us, but we can't count on that. Am I disappointed that the Obama administration is pushing for more oil exploration? Absolutely. Am I surprised? Not at all.